Corinne Grace Blakeman of Sylvania, Ohio, age 95, died peacefully on Monday, September 10, 2018 at Kingston Care Center, King Road, Sylvania, Ohio. 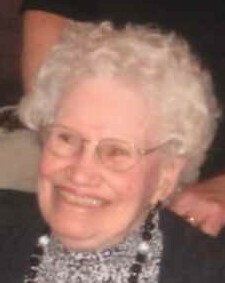 Corinne was born on February 24, 1923 in Perrysburg, Ohio, the daughter of the late Anna Rutchow and William B. Ward. Spending time with family and friends were Corinne’s passion and delight. She loved to host family gatherings and never allowed anyone to leave her home without a dozen or so of her “famous cookies” … hence the nickname “Cookie Grandma”. In her younger years, up to her early nineties, Corinne enjoyed sewing, playing the piano, baking, quilting, gardening, homemaking, and just “being a mom”. She enjoyed her daily cup of coffee, normally shared with a friend over good conversation. Always quick with a smile, she never had a bad word to say about anyone. Corinne was a devoted Christian and loved our Dear Lord and Savior Jesus Christ. She was an active member of Zoar Lutheran Church, Perrysburg, Ohio in her younger years, and Epiphany Lutheran Church and Hope Lutheran Churches (Toledo, Ohio) in her later years. Some of her church duties over the years included: teaching Sunday School, pianist, attending bible studies, serving on alter guild, welcoming committee, visiting shut-ins and various other humble roles. Corinne and her loving husband of 49 years, George R. Blakeman (who passed in Mar 1998) enjoyed traveling with their family throughout the states, especially to the Rocky Mountains. Many summers were spent renting an old log cabin in Wyoming, experiencing the “wild west” life. Although not a typical (nor relaxing) vacation, her children and visiting relatives and friends really enjoyed it… and so did she. Corinne was a beloved wife, mom, grandma, great-grandma, sister, aunt, cousin, and friend to many and will be deeply missed. She is survived by her six children: Gary (Beverly) Blakeman of Sylvania, Ohio; Douglas W. (Sherry) Blakeman of Bonita Springs, Florida; Howard C. (Sherri) Blakeman of Holland, Ohio; Donald P. Blakeman of Safety Harbor, Florida; Carol A. (Bill) Clevidence of Cincinnati, Ohio; and Jan M. Fuller of Parker, Colorado. She is also survived by twelve grandchildren, eleven great grandchildren, and countless friends and relatives. Friends may join the family for visitation at Reeb Funeral Home, 5712 N. Main St., Sylvania, OH Weds, Sept. 12, 2018 5pm-8pm. Funeral service to be held Thurs., Sept. 13, 2018 10:30 AM at Hope Lutheran Church, 2201 Secor Rd., Toledo, OH 43606. Interment to follow at Toledo Memorial Park. Those wishing to give a memorial are asked to consider Hope Lutheran Church or donor choice.